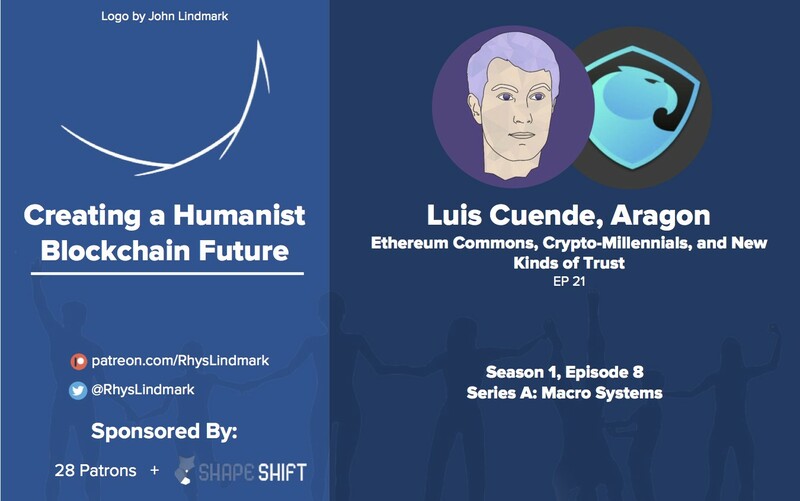 In this episode of Creating a Humanist Blockchain Future (Youtube, Soundcloud, iTunes), I interview Luis Cuende, a co-founder of Aragon, a blockchain project that allows you to build decentralized organizations on Ethereum. We chat about projects in the Ethereum Commons, crypto-snake people, and new kinds of trust. Give it a listen if you’re into early-stage commonism, generational dynamics, or breaking down abstract concepts like trust! And, as always, let me know if you have any feedback! In the Ethereum Commons. See: ProjectTransparency, the beginnings of a Rocket.chat migration, and the completing of a Rocket.chat migration. Thanks to Mike Goldin, John Desmond, Colin Wielga, Harry Lindmark, Joe Urgo, John Lindmark, Jacob Zax, Katie Powell, Jonathan Isaac, Brady McKenna, Jeff Snyder, Ryan X Charles, Chris Edmonds, Ned Mills, Kenji Williams, Scott Levi, Peter Rodgers, Keith Klundt, Andrew O’Neill, and Kenzie Jacobs for supporting me on Patreon! Thanks to Shapeshift for sponsoring the show! Please use them/check them out! About Me: My name is Rhys Lindmark and I’m a social entrepreneur. I’m Creating a Humanist Blockchain Future by: a) Empowering the Colorado Blockchain community (check out our ETHDenver hackathon! ), b) Developing the Ethereum Commons as a Meta Community Manager and c) Hosting a systems podcast with experts. I’m an alumnus of Techstars Boulder 2015 (Edify). Please reach out if you’d like to connect or have feedback! I’m curious about what you’re working on. You can support me on Patreon, follow me on Twitter, or connect on LinkedIn. Disclaimer: I own less than $100 of any given cryptocurrency, so my monetary incentive is not directly aligned with Bitcoin, Ethereum, etc.